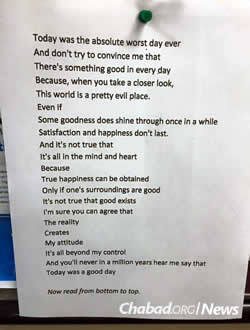 This poem written by 17-year-old Chanie Gorkin, with its unique style and positive message, was tweeted and went viral. An inspirational poem written by a 16-year-old Lubavitch girl, Chanie Gorkin from the Crown Heights neighborhood of Brooklyn, N.Y., went viral this week, sharing a Chassidic message of hope with more people than Gorkin could have imagined. Unbeknownst to the young author, the poem—titled “Worst Day Ever?”—was printed and posted on a board in a North London bar when someone took a picture and tweeted it. The poem went viral, attracting attention from media outlets on both sides of the Atlantic, including Mashable, The Huffington Post, ABC, NBC and The Telegraph. A few days later, Dena Gorkin, herself a principal at the Bnos Chomesh Girls High School in Crown Heights, shared her daughter’s poem with a student who was having a bad day. “My student read it and was blown away,” she relates. Not long afterwards, the poem was entered into a poetry competition on PoetryNation.com, making it into the semi-finals before ultimately being passed over. The poem was also published in N’shei Chabad Newsletter, a Chabad magazine for women, and its life was prolonged by being popularly shared on Facebook and making the rounds on the WhatsApp messaging service. The story seemed to be petering out until one tweet from the other side of the world set social media ablaze and traditional media scrambling. “The poem, which was helpfully posted on ‘some wall’ in London (because as we all know, Londoners are almost always in need of a bit of perking up), has two alternate meanings depending on whether you read it from top to bottom or bottom to top, and is guaranteed to make you think,” wrote The Metro, a London newspaper. Since being reported on, an image of the poem has been posted on many sites and read by millions of people. Chanie herself was not the one to post her work on Facebook; as she puts it, she’d rather hang out with her friends in real life. Although she didn’t seek international attention, the sociable and studious Gorkin—who got an “A” for the poem in school—is happy if it has a positive effect on someone, somewhere. today's generation It warms my heart to see that teenagers of today's generation have so much more clarity than the teenagers of my generation. Chasidic teachings are so refreshing. Look at the effect they have on our world. The poem is the product of an integrated mind and sensitive heart. It reveals a truth to help anyone and everyone who reads it. Girl's Poem This poem has a strong emotion wither way you rad it. Very inspiring, full of hope and encouragement.